Mommy's Wish List: Ulta: $3.50 off $10 printable coupon + what really works. Ulta: $3.50 off $10 printable coupon + what really works. Print a $3.50 off a $10 coupon for your next purchase at Ulta here. Coupon is good thru May 13th. There are of course, tons of beauty products at Ulta (which I've tried, believe me) so how do you know what really works? I'll tell you. Here's one I cannot live without. And of course, I use an Ulta coupon to get it every time I run out, so I'm not paying full-price for it. No matter what it is, I think there's always a way to get it for less. What beauty product at Ulta really works? I used my Ulta coupon to get some Kenra Spray Gloss. Why? I have naturally fine, wavy, and in humid weather – frizzy, hair. But Kenra is truly amazing to keep my hair straight and shiny even on humid days. 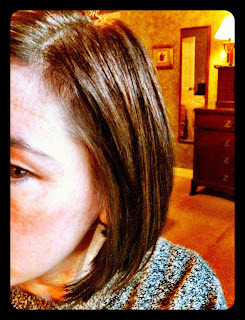 I took a picture this morning to show you how straight and shiny my hair is now, after blow-drying, and using Kenra. Kenra also makes a fantastic Blow-Dry Spray that you put on your hair while it's wet. Then, when you blow-dry, it makes your hair come out even more straight and shiny. No frizz. The combination of these two products gives me the hair I've always wanted, but didn't get at birth. You know, the hair those girls have on TV. It stays this way all day too, even if I'm outside. Want to get your Kenra on-line instead of in the store? You can also get your $3.50 off on-line at Ulta.com, and get 3% back to boot. Go to Ebates here. Find Ulta. Click on that. Use code 72783 at checkout. Remember, at Ulta.com you get 3 FREE samples with EVERY order too! If I were new to Ebates, and this was my first purchase thru them, I'd get a $5 bonus plus the 3% back (once I've spent $20 on-line thru Ebates). Rebates from Ebates are a bonus for doing what I'm already doing – shopping on line. They add up from all my on-line purchases I make thru them, and every quarter I get a rebate check. Want to know what other printable coupons are available for stores at the mall? You'll find them here. Subscribe to Mommy's Wish List so you don't miss a deal on beauty products that really work.